NYC, 02/13/2019, 6:00PM. 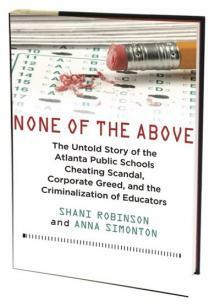 None of the Above: The Untold Story of the Altanta Public Schools Cheating Scandal, Corporate Greed, and the Criminalization of Educators. Shani Robinson and Anna Simonton explore how racist policies and practices cheated generations of black children out of opportunities long before some teachers tampered with tests. Examining the corporate education reform movement, hyper-policing in black communities, cycles of displacement and gentrification, and widening racial and economic disparities in Atlanta, they reveal how the financially powerful have profited from privatization and the dismantling of public education. Against this backdrop, they cast the story of the cheating scandal in a new light, illuminating a deeply flawed investigation and a circus-like trial spun into a media sensation that defied justice.